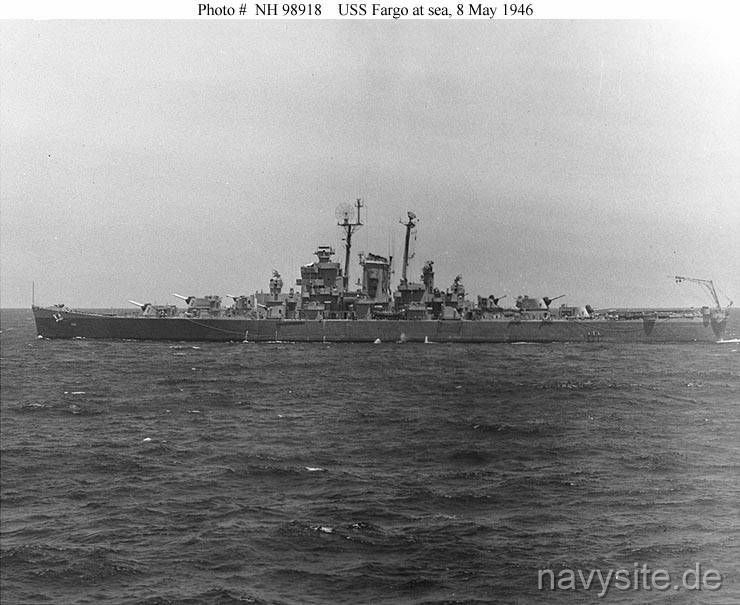 Named after the city of Fargo, ND, USS FARGO was the lead ship of the FARGO - class of light cruisers. Decommissioned after only five years of service, the ship was stricken from the Navy list on March 1, 1970, and sold for scrapping in August 1971. This section contains the names of sailors who served aboard USS FARGO. It is no official listing but contains the names of sailors who submitted their information. Click here to see which USS FARGO memorabilia are currently for sale on ebay. 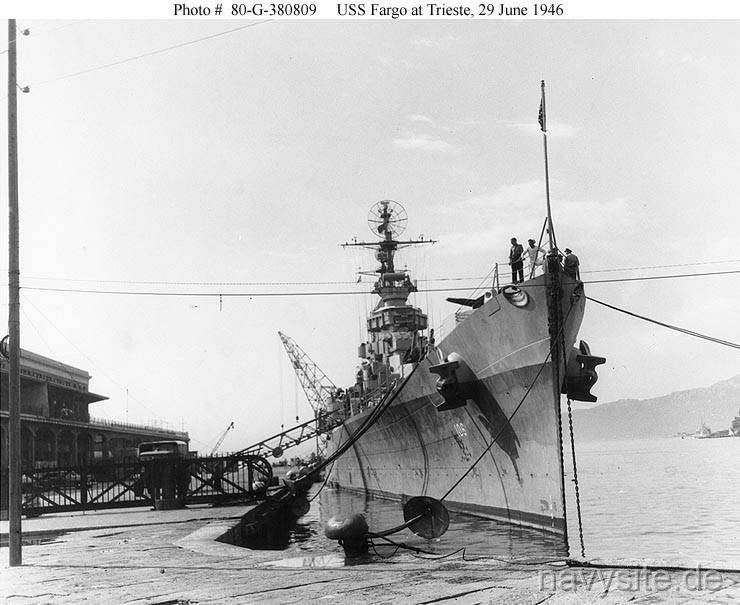 Placed in commission on 9 December 1945, USS FARGO headed south a few days later on her shakedown training cruise. In the sunlit waters off Guantanamo, Cuba, the crew worked and trained and put their new cruiser through her paces for three long months, but when the time was up FARGO and company were an efficient team. 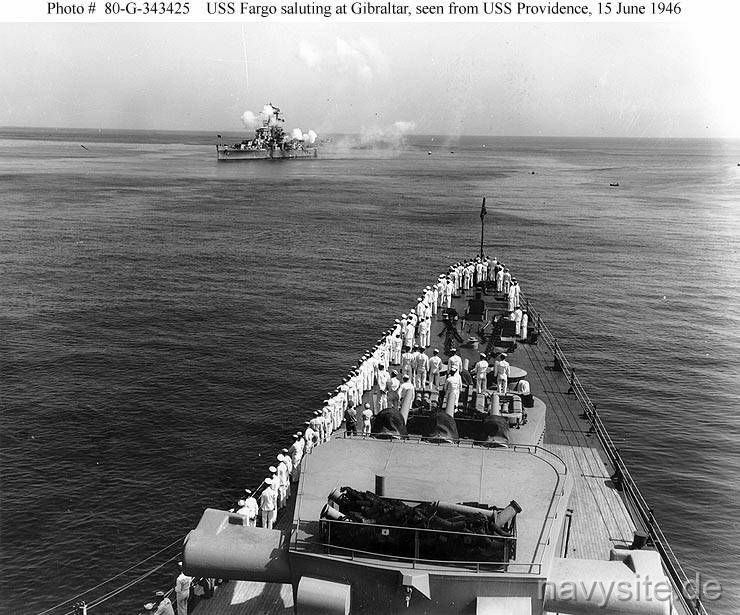 Thirty days later FARGO received her first assignment when she was ordered on a South American-Mediterranean good will tour as flagship of Vice Admiral B. H. Bieri, USN, Commander TENTH Fleet. Ten months were spent plying the waters of the Mediterranean, the cradle of history and mankind. These ten months were well spent, holding the far flung battle line of a conflict that never ended; "showing the flag". 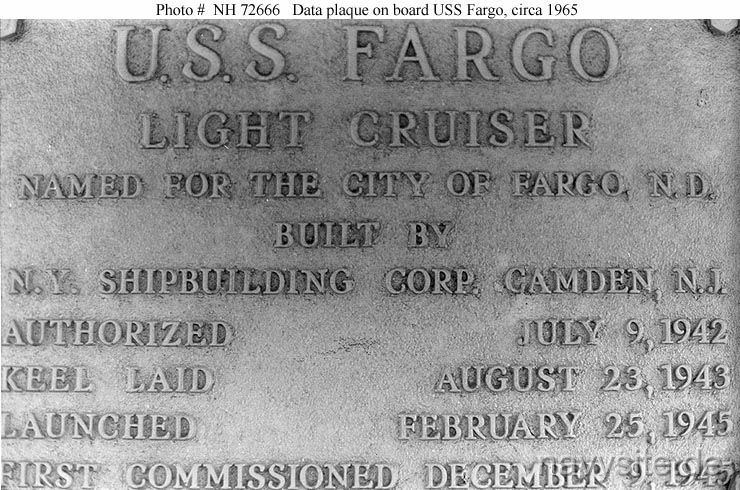 February 1947 found FARGO home again but not for long. 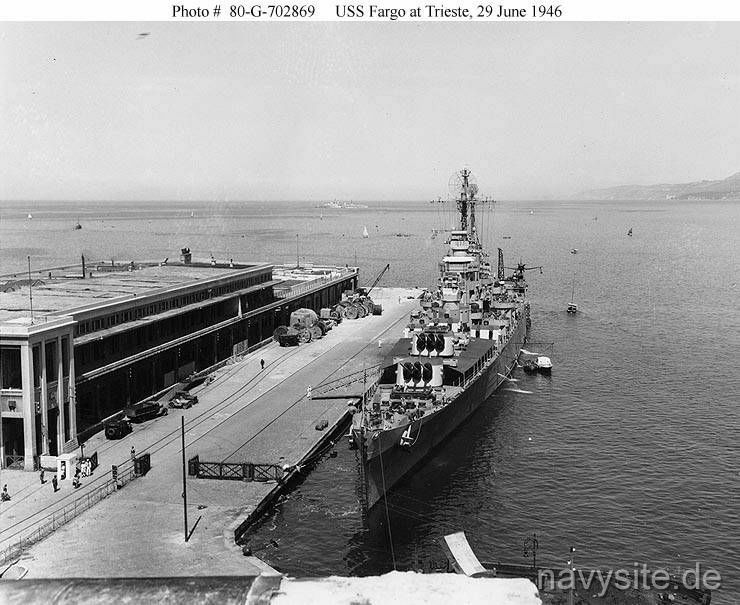 Again in May 1947 FARGO returned to serve as flagship Commander Naval Forces Mediterranean and the summer of this year was spent in re-visiting the seaports of the Mediterranean. The FARGO headed westward through the pillars of Hercules on 5 September and rigged ship for the stormy passage to Narragansett Bay. While at anchor in Newport, R.I., FARGO received orders to rendezvous with units of SECOND Task Fleet at sea for the "Cold Weather Cruise" of 1947. After her return to Newport FARGO made her way to Boston and the Charlestown Navy Yard via the Cape Cod Carial. This was a cold difficult winter for the ship. Demobilization and large personnel turnovers critically thinned the ranks of the seasoned personnel. However March 1948 found FARGO untangled from the shoreside telephones and compressed air lines of the yard and proceeding south to shake-down the Boston ice and an almost completely new crew. 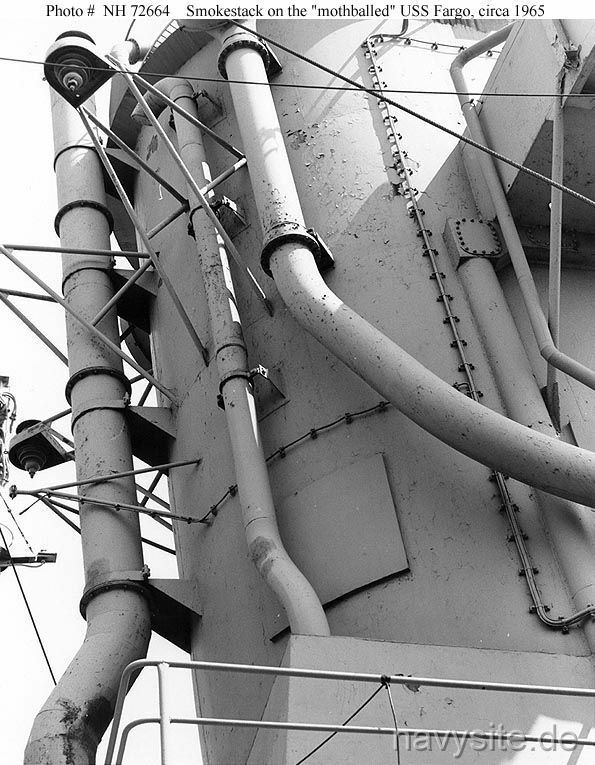 This training period was the longest, toughest six weeks most of the crew have ever known, but FARGO was pronounced "ready" upon completion of her refresher training. Blue Carribean skies melted into gray Atlantic overcast as FARGO steamed north for Newport early in May. Never able to withstand for long the call of the Mediterranean, FARGO sailed eastward for Suda Bay, Crete, where, in June 1948 the ship broke the 3 starred flag of Vice Admiral Forrest P. Sherman, Commander SIXTH Task Fleet. Athens, Naples, Istanbul, Cannes and the rest were visited again until September when FARGO was relieved at Gibraltar by USS ALBANY (CA 123). 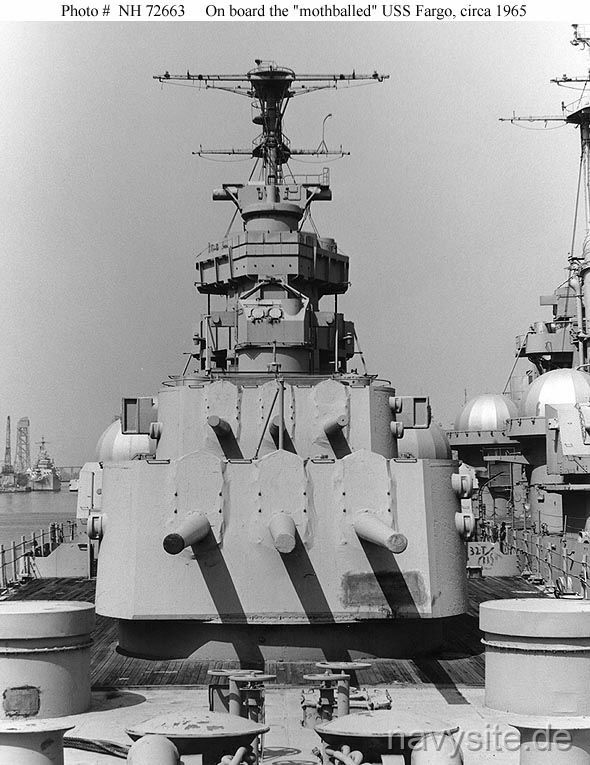 Boston received FARGO on 2 October 1948 and after a winter of SECOND Task Fleet exercises, upkeep and training periods, the ship once again prepared to resume her proud role as Flagship SIXTH Task Fleet. FARGO left for the Mediterranean 28 February 1949 and spent the following months in the familiar waters between Africa and Europe. The cruiser returned home on 21 September 1949. 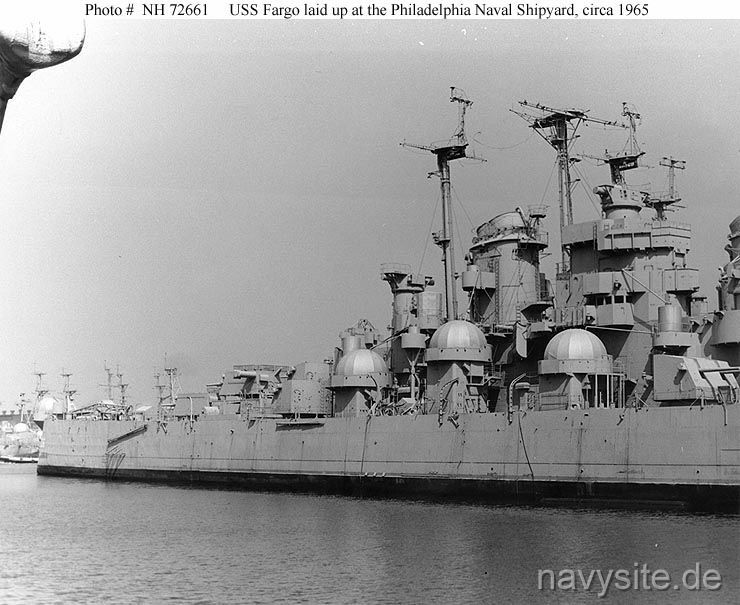 The Truman Administration's late 1940s defense cutbacks resulted in a considerable reduction in the active U.S. Navy cruiser force, and FARGO was among the ships affected. She was decommissioned on 14 February 1950 and laid up in the Atlantic Reserve Fleet. 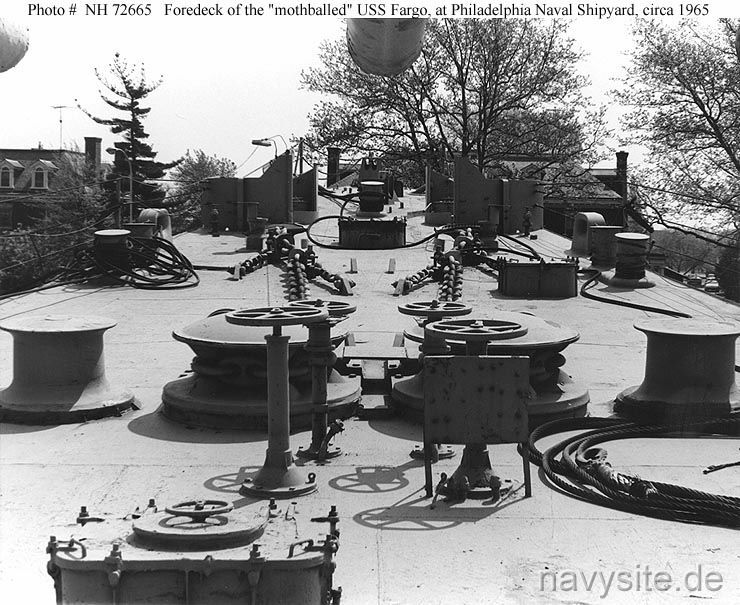 Initially berthed at Bayonne, New Jersey, she was later moved to the Philadelphia Naval Shipyard, Pennsylvania, where she remained until sold for scrapping in August 1971. Back to Light Cruisers list. Back to Ships list. Back to selection page. Back to 1st page.